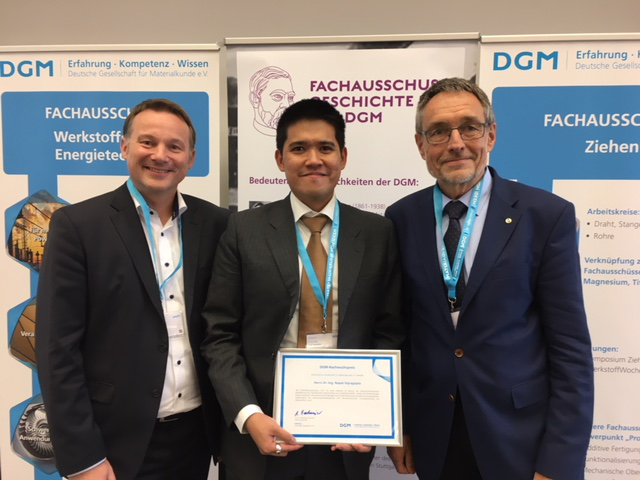 ICAMS group leader Napat Vajragupta has been awarded the Prize for Young Talents (DGM-Nachwuchspreis) from the German Materials Society (DGM) for his work in the field of micromechanical modelling of dual phase steels. The DGM Prize for Young Talent is dedicated to PhD students and post docs, who are working on a research subject in the field of materials science and show excellent scientific achievements from their previous and current results. Prof Alexander Hartmaier, Dr. Napat Vajragupta and Prof Wolfgang Bleck during the award ceremony.